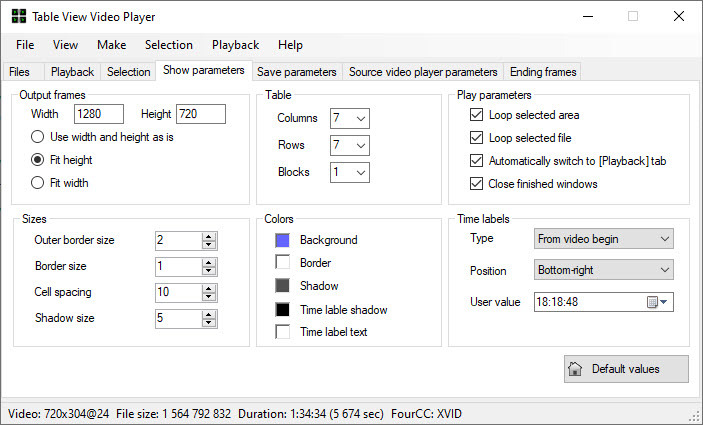 Table View Video Player - a software product for analyzing video files and search for them in certain scenes, events or objects. The chip program in how it displays video. And it does this by using the table view. If you have a powerful enough computer and monitor with high resolution and wide screen, you can view the video in the form of a table where each cell is a separate fragment. Suppose we choose a table size of 7x7, and are looking for a certain scene in a video lasting 2 hours. Then, divide a program into pieces all video duration (2 hours) * (60 minutes per hour) * (60 seconds in a minute) / (7 * 7 cells in the table) = 7200/49 = 147 seconds, i.e. 2.5 minutes. Depending on the power of the processor, playback may be faster or slower. Even if it takes 5 minutes. But during this time, you can easily find the desired scene in your favorite movie or whose notice the infiltration of the protected object. With this software, you can also quickly see the new film, to decide whether to spend their time on it. And if you are doing video editing, you can check the finished video for the presence of coding artifacts or other defects. To view the found scenes just click the mouse on the desired cell and the video will be shown starting at that position with the integrated video player. Found scenes can select and save the video or sound. Individual frames or selected parts can also be saved. 1. All copyrights on the "Table View Video Player" is exclusively owned by the author - Alexander Alekseev. Name "Soft4other" is the pseudonym of the author of the program. 3. After payment, the user is granted a non-exclusive license to use the "Table View Video Player" for any legal purpose; the user receives the activation code in an amount corresponding to the number of licenses purchased. An activation code is permitted to activate the "Wizard" on the same computer, but you can use the same activation code on the second and third computer, provided that the two programs at all (three) computers will use the personal user and / or members of his family and no one else. 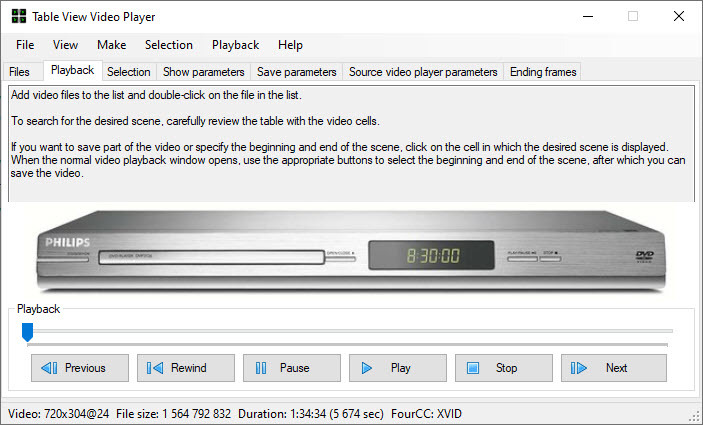 Customers pay for the license, receive technical support, gain new minor version of "Table View Video Player" for free. 4. Installation files (zip-archive) "Table View Video Player" can be freely distributed only in the form in which they are delivered, that means without any changes. You may not distribute "Table View Video Player" on one carrier and / or in one software package together with piracy utilities for "breaking", Key files and generators of keys. 6. PROGRAM "Table View Video Player" DISTRIBUTED "AS IS". THUS THERE IS NO WARRANTY, EXPRESS OR IMPLIED. YOU USE IT AT YOUR OWN RISK. THE AUTHOR WILL NOT BE LIABLE FOR DATA LOSS, DAMAGES, LOSS OF PROFITS OR ANY OTHER KIND OF LOSS WHILE USING (correct or incorrect) of the program. 7. Does not provide any additional fees other than the cost of the license associated with the creation and distribution of data files "Table View Video Player." 8. You may not use, copy, emulate, clone, rent, lease, rent, sell, modify, decompile, disassemble, transfer licensed program or its part differently than described in the license. Any such unauthorized use shall result in immediate and automatic termination of this license and may result in criminal and / or civil prosecution. Do not use the binary code "Table View Video Player" to reconstruct the algorithm of the program, which is the property of the author. 9. Installing and using the "Table View Video Player" indicates your agreement with the terms of this license. 10. If you do not agree with the terms of this license you must remove files "Table View Video Player" from your storage devices and cease to use, "Table View Video Player". Thank you for using the program "Table View Video Player"! The ability to save videos in a table view format. Flexible number of rows and columns in a table, as well as video encoding parameters (preserving). The description indicates that the application is 64 bit, but TableViewVideoPlayer.exe executable file is a 32 bit application. Can the application run in 32 bit operating system? 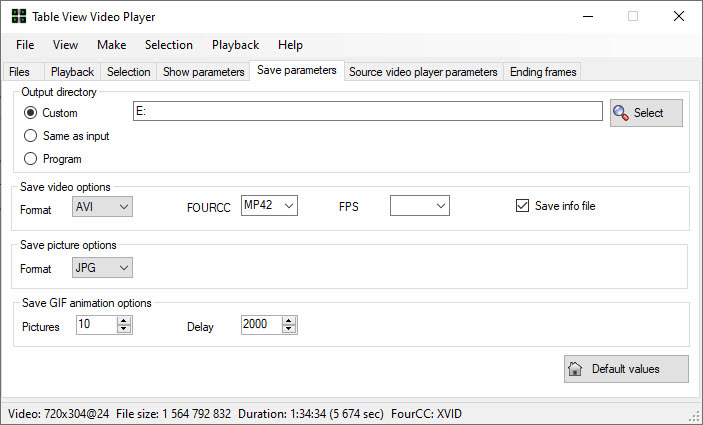 TableViewVideoPlayer.exe really is a 32 bit application and can be run in both 32 and 64 bit operating system. However, they run EXE files and dynamic libraries are 64 bit, which makes their use impossible. As well as the main code of the program contains in them, the full-time job applications are only available in 64 bit operating system. Why in some cases, the program displays an error message, even for a small number of rows or columns? The problem stems from a lack of memory 32-bit application. When viewing high-resolution video and a significant number of the cells of the table the application may simply lack the RAM (2 GB limit) even if the system has sufficient memory. Unfortunately I have an application to run, but then an error message appears. May be you have 32-bit Wiondows? Third version not properly working on the 32-but Windows. You must use 64-bit Windows instead! Нужная прграмма, автор! Давай еще!